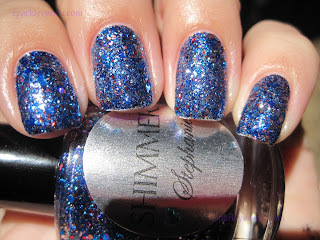 Another gorgeous blue blend from Shimmer Polish. This one is packed with sparkly glitters, and it has some small blue hexagons like Liana. This one is different than Nichole in that it has less red glitter, and it doesn't have that holographic silver that Nicole has. 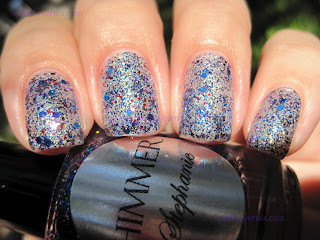 They all have great formula, honestly Shimmer Polish is very consistent when it comes to formula. If I had to choose one of these blues, I would choose Liana, although Nichole and Stephanie are great for those holidays when you want to wear red and blue nails, so it's a tough choice. 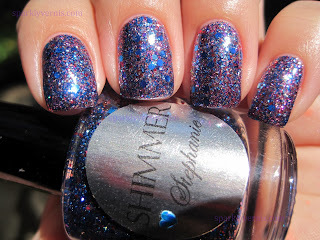 Bottom line, if you are a blue lover, you have lots to choose from at Shimmer Polish. Stephanie is making my list!